The cocktail was not invented in New Orleans but it certainly calls NOLA home. 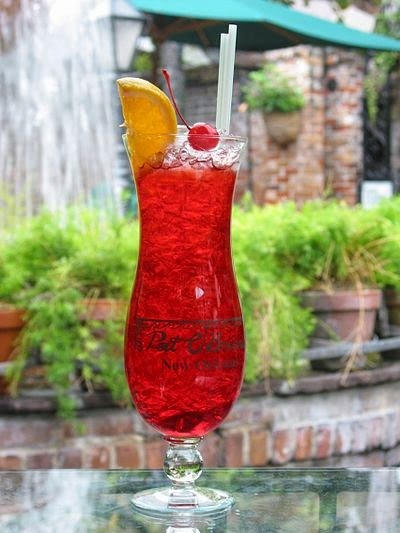 Certainly some famous and delicious libations grew out of the Big Easy. 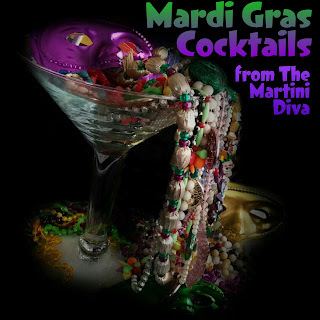 You can, of course, have any cocktail you'd like in New Orleans but there are a few you need to try if you want to "drink in" the true spirits of the birthplace of jazz. Heck, you wouldn't go there without having a beignet, some mudbugs (Crawfish), gumbo, King Cake or chicory coffee, why miss the local liquid offerings? 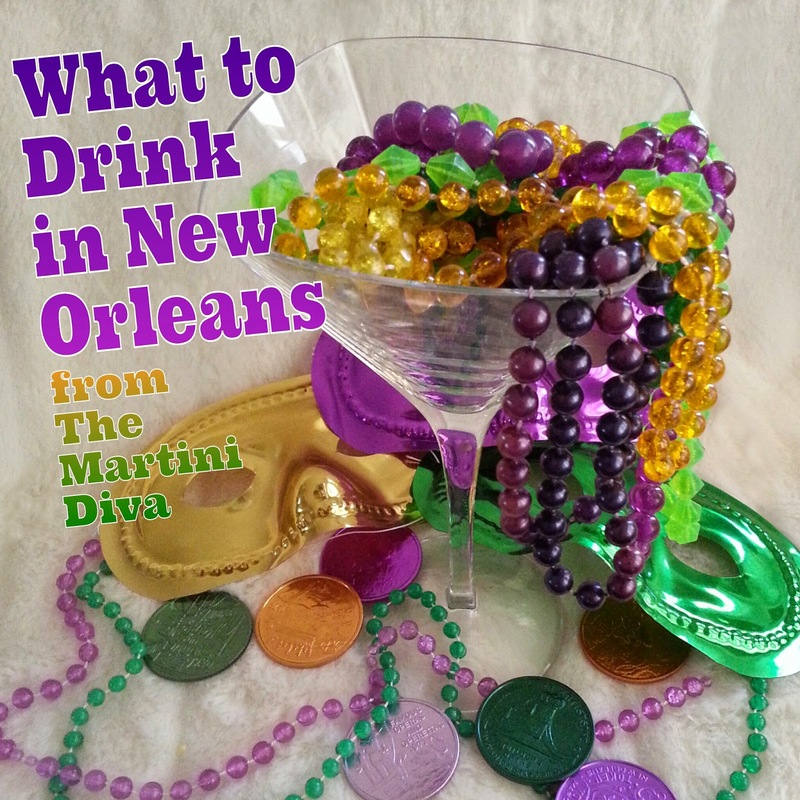 What to drink in New Orleans? Wash the an Old Fashioned (rocks) glass with the absinthe. (Washing a glass is rolling the liquid in the bowl then dumping out the excess), set glass aside. Drop the sugar cube in another Old Fashioned glass, add the drop of Angoustura Bitters to the sugar cube, then the water and muddle with the cognac. Add ice, stir until chilled then strain into the absinthe washed rocks glass, express the lemon twist over the drink then discard the twist. HURRICANE Beloved by tourists and Spring Break collegiates. Created in New Orleans by Pat O'Brien in the 1940's. 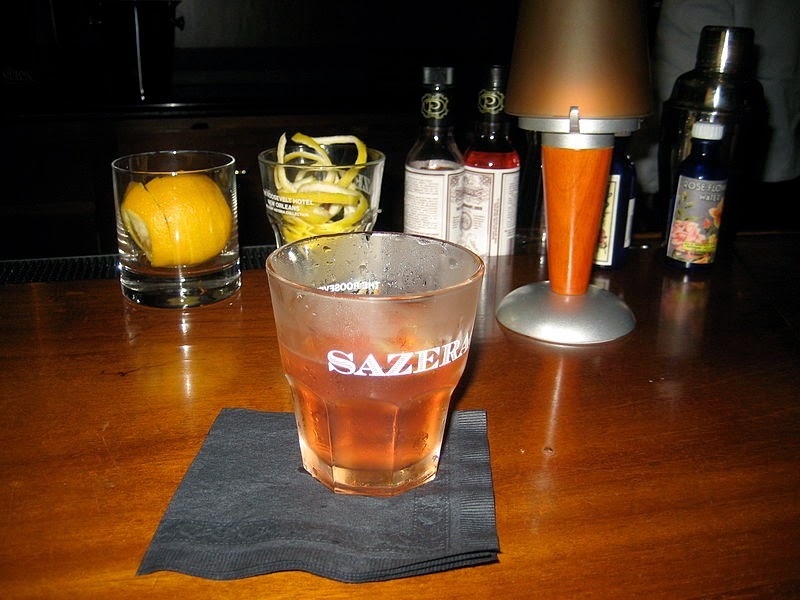 VIEUX CARRÉ Invented by Walter Bergeron, the head bartender at the Monteleone Hotel (Carousel Bar) in New Orleans in the 1930s, the Vieux Carré was named after the French Quarter , the "Old Square" (Vieux Carré). The house cocktail of the famous Arnaud's Restaurant in the 1940's, this is a Southern take on a Rob Roy where the sweet vermouth and Angoustura Bitters are replaced with the Dubonnet and orange bitters. Stir in a mixing glass with ice until chilled then strain into a chilled cocktail (martini) glass. 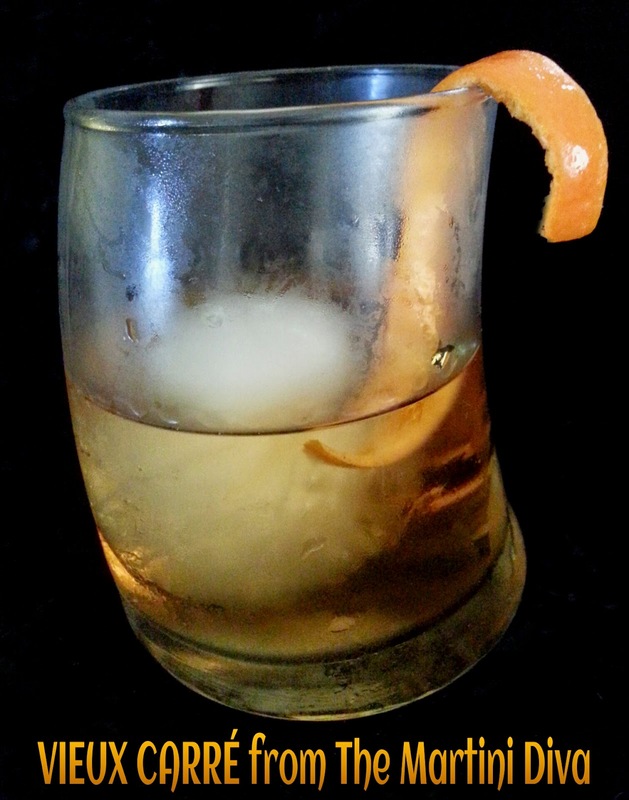 Express then garnish with an orange twist. 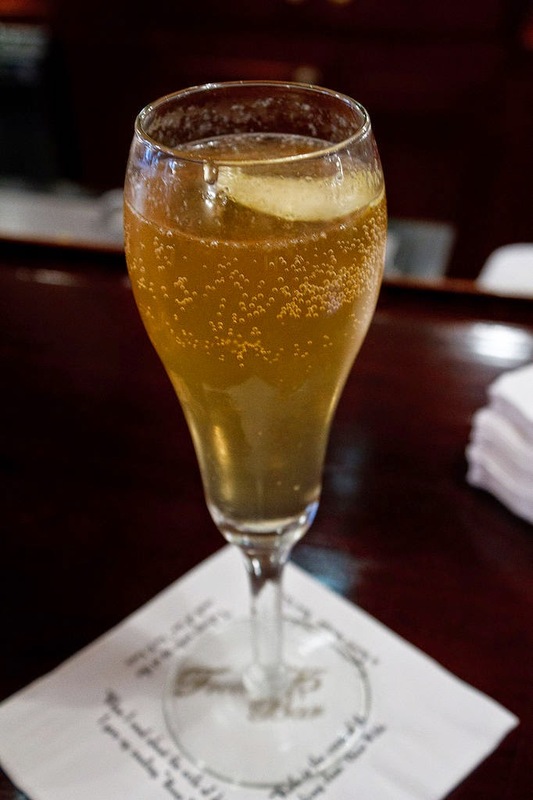 FRENCH 75 Named for a French artillery gun, the French 75 was created in 1915 at the New York Bar in Paris (Harry's New York Bar) by Harry MacElhone. 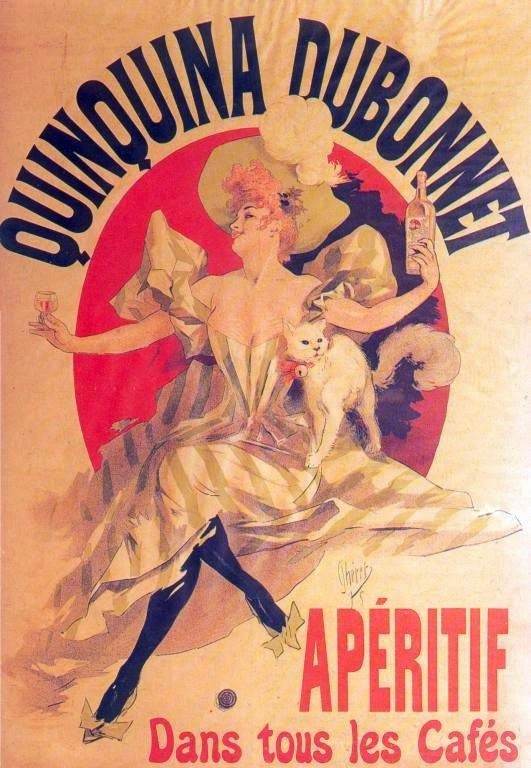 There is another version that substitutes cognac for the gin, but not in my universe. Add the gin, simple syrup, and lemon juice to a cocktail shaker filled with ice. Shake until well chilled and strain into a Champagne flute. Top off with the Champagne. Garnish with a lemon twist. RAMOS FIZZ My favorite of the bunch! 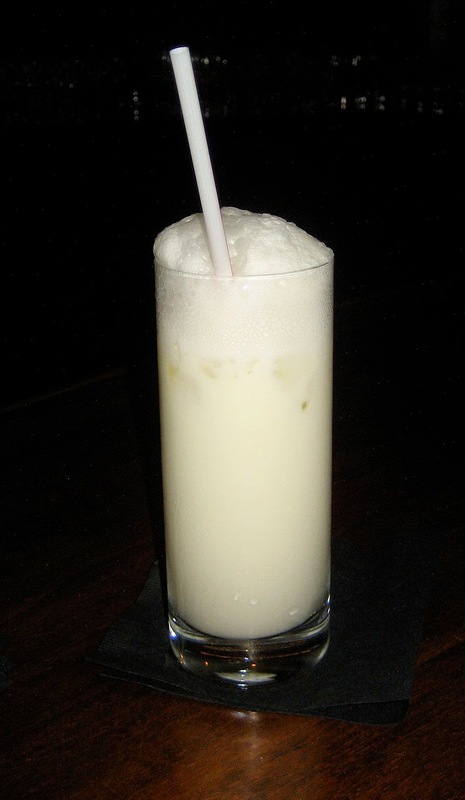 Originally called a New Orleans Fizz, the Ramos Fizz was invented by Henry C. Ramos at his bar in Meyer’s restaurant in New Orleans in 1888. I have several fun versions myself; the Cherry Diamond Ramos Fizz, the Golden Ramos Fizz and the Absinthe Minded Leprechaun! Combine all the liquid ingredients in a blender and dry blend for a minute to emulsify the egg white and aerate the cocktail. Transfer this to an ice filled cocktail shaker and shake vigorously for another minute to chill. * Pour into a Tom Collins glass and garnish with an elaborate orange rind carving. * Interesting fact: back in the good old days, before blenders, creator Ramos insisted you needed to shake the Ramos Fizz for a full 15 minutes. This is what was required to create the meringue like consistency of this cocktail. There is the famous incident where one bar lined up 15 shaker boys and sent the cocktail down the line because one shaker boy could not shake a cocktail longer than a minute without his arms seizing up! Thank goodness for mod-cons! Throw me something, mister! Like cake! And put it a cocktail! The King Cake is a traditional Mardi Gras/Epiphany dessert that takes it's name from the Magi, the three kings who visited the new born Christ in the manger. It started out as an Epiphany Feast bread, then, three centuries ago, became a bread with sugar on top and beans inside. Now it's a bread style cake flavored with cinnamon, stuffed with cream cheese, frosted and decorated in the traditional Mardi Gras colors of purple, green and gold. It also always has a plastic baby figurine hidden inside. King Cake, brought to New Orleans by French settlers, became a traditional food of Mardi Gras parties around the late 1800's. The baby tucked inside represents the baby Jesus* and the tradition in New Orleans is whoever gets the baby in their piece of cake hosts the Mardi Gras party next year. 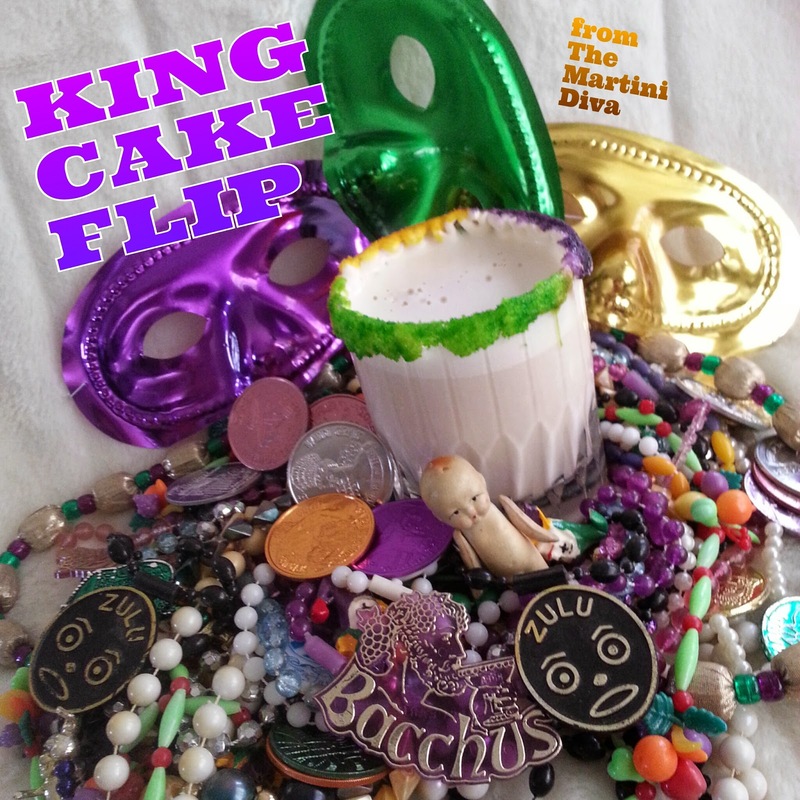 The colors of Mardi Gras and the King Cake represent the colors of the crowns of the Magi; purple for justice, green for faith, and gold for power. 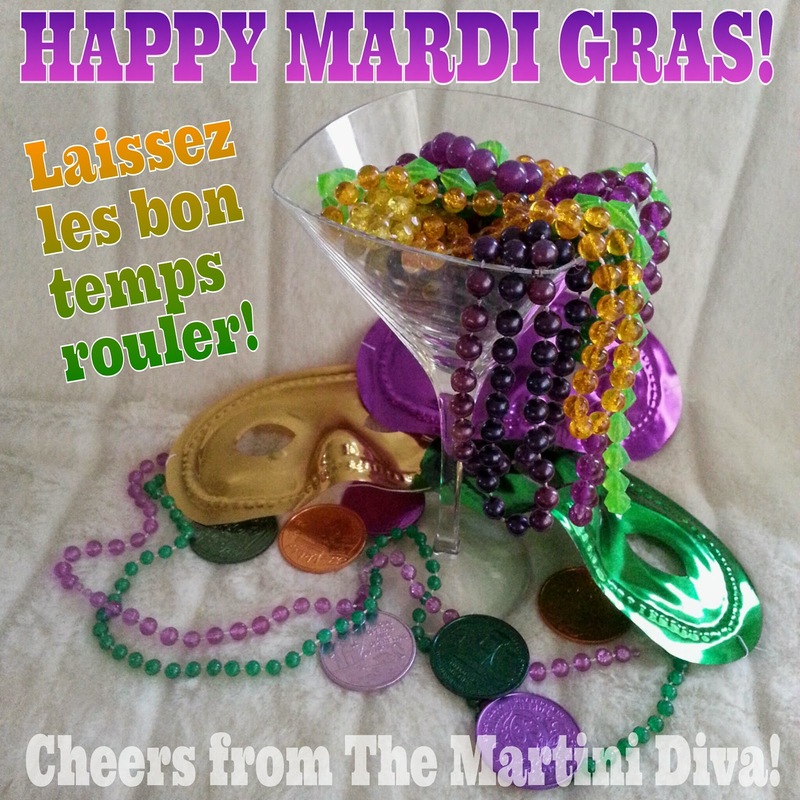 Mardi Gras, French for Fat Tuesday, is also known as Shrove Tuesday, and is celebrated the Tuesday before Ash Wednesday by indulging in rich foods, drinks and enjoying parties. It's the last ditch binge before the repentance and austerity of the Lenten season. SPECIAL TOOLS: Blender, Piping bag, dessert plates for sugar rim, Old Fashioned glass. DIRECTIONS: Pipe some cream cheese on the rim of your glass. Dip a third of the rim in each of the colored sugars. Chill your glass in the freezer. Add the rum, vodka, egg, cinnamon, half and half and the brown sugar to a blender and blend on medium to emulsify the egg. This is an easy way to dry shake an egg cocktail. Fill a cocktail shaker with ice, pour in the blended cocktail and shake until chilled. Pour this into your rimmed glass, sprinkle on a dusting of cinnamon and serve. Garnish tip: You can add a tiny plastic baby to the rim if you like. 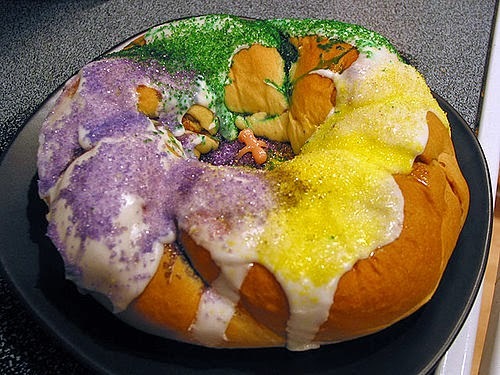 I rarely garnish my cocktails with anything that's not edible, however the baby is a big part of the King Cake tradition. If you're good at sculpting fondant or chocolate you can sculpt a tiny little baby and add that to your rim. Sadly, though I am an artist, I am not a sculptor and I couldn't find a little edible baby anywhere BUT I did have the Cupie Doll baby my Dad brought home from WWII so I tucked that in with the beads and doubloons for the photo! (Feel free to correct me where I'm wrong!) In Western Christianity a dinner is eaten on the Eve of Epiphany (the night of January 5, also known as Twelfth Night or Three Kings Day). Known as the Epiphany Feast it often included the gifting and eating of sweetened breads. This bread evolved into the modern King Cakes of today. In the Catholic Church the holiday season follows a path from the advent of Christ to his resurrection. Advent is the celebration of the coming of Christ and leads into Christmas. The Epiphany season celebrates the revelation of Jesus as the son of God, and starts on the evening of December 25th and goes through January 6th. Also known as The Twelfth Day of Christmas, Epiphany is the climax of the Advent/Christmas season, ending on the Tuesday before Ash Wednesday (Fat Tuesday!) and leads into Lent. Ash Wednesday, the beginning of Lent, is a six week period of atonement and self denial which leads to the Easter season. On the liturgical calender Lent ends the day before Good Friday, the day Christ died, and is the Friday before Easter Sunday, which is the celebration of the resurrection of the Christ. The dates can change somewhat with the year, the locale and the denomination of the church doctrine. CAN I TOP THAT OFF FOR YOU, MR. PRESIDENT? Thanks to a tweet from Mixellany.com (@Mixellany) I read this fun article from Vanity Fair by Alex Beggs on favorite cocktails of our Founding Fathers. 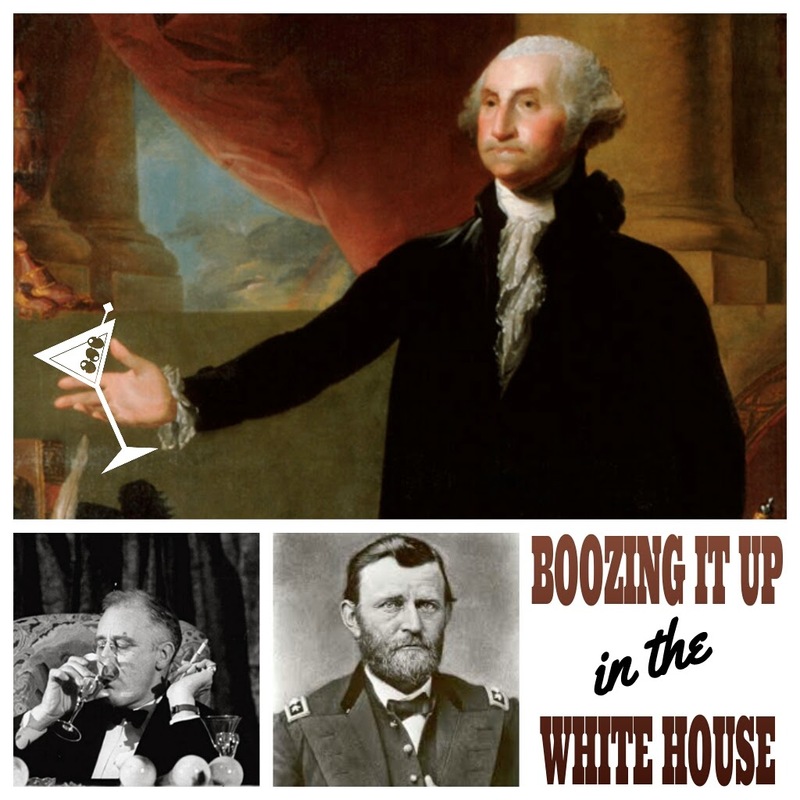 It listed some of the preferred alcoholic drinks of past Presidents of the United States from George Washington up to Gerald Ford and also presented an encapsulated view of the history of American happy hour tastes. 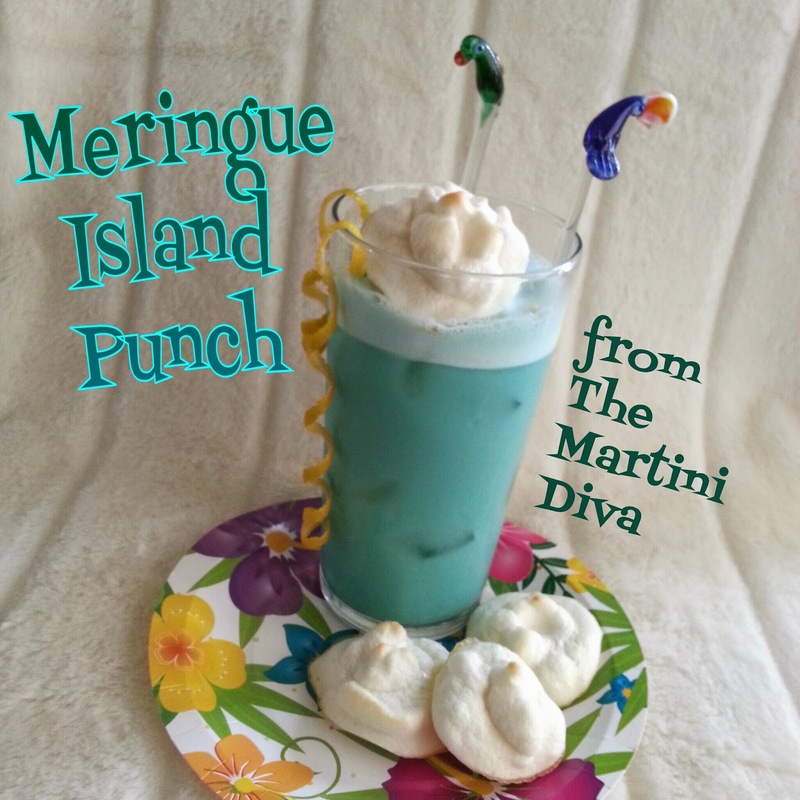 MERINGUE ISLAND PUNCH Tweak of Ulysses S. Grant's Meringue and Roman Punch. 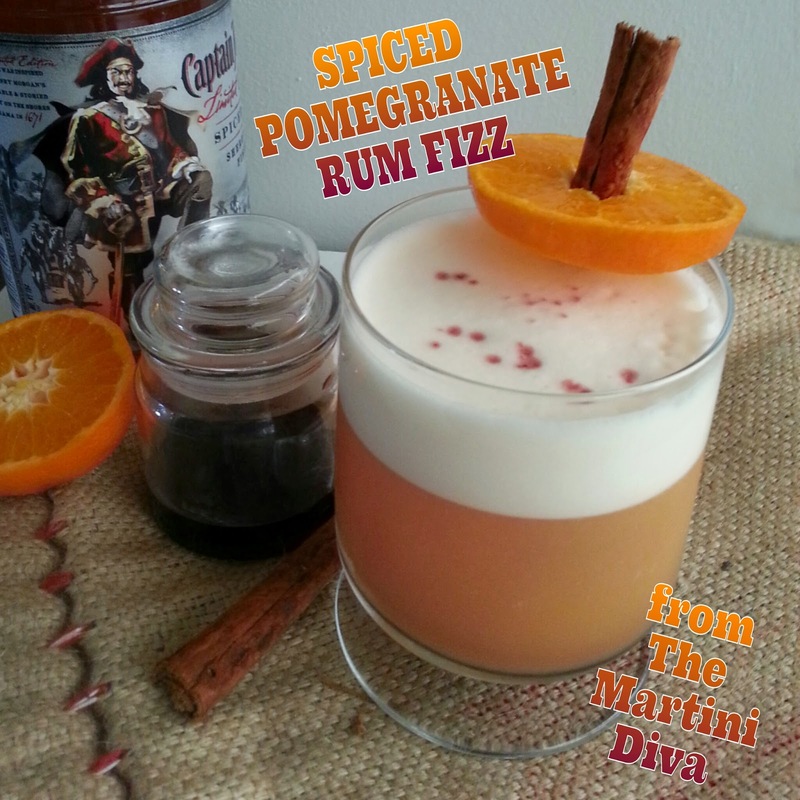 SPICED POMEGRANATE RUM FIZZ Tweak of Franklin Delano Roosevelt's Haitian Libation. If you'd like to try out Robitschek's original recipes with his full directions check out his article on Vanity Fair. AN INTERESTING ASIDE: Beggs mentions in the first sentence that Benjamin Franklin was in the habit of having a hard cider with his breakfast. Today this would be a sign of a drinking problem, however this was not an unusual habit to have back in colonial America where beers, ales and ciders were simply a part of their daily menus. Keep in mind that the early settlers of America believed, like their European counterparts, that alcohol was medicinal. Additionally, drinking water could be dangerous because, even though there was an abundance of water sources, there was no way to tell what was safe and what was polluted and people often sickened or died from tainted water. Add this to the fact that even untainted water, extracted from natural sources, was often full of sediments and mud and required settling or filtering before it was drinkable and it makes sense that Franklin would grab a quick cider instead! If you like trying out early American cocktails, you might also enjoy my RATTLED SKULL, a modern day version of the popular colonial cocktail, the Rattle Skull.